We know what you’re thinking, those Red Bull Air Races are so cool, but do they have to be such gas-sucking spectacles? No. Enter Cri-Cri, the world’s first four-engined all-electric aerobatic plane. Developed by the European Aeronautic Defence and Space Company (EADS), the plane made its debut at this week’s Green Aviation Show in Le Bourget, France. rate of about 17 feet per second. The plane also features four brushless electric motors with counter-rotating propellers along with high energy density lithium batteries. 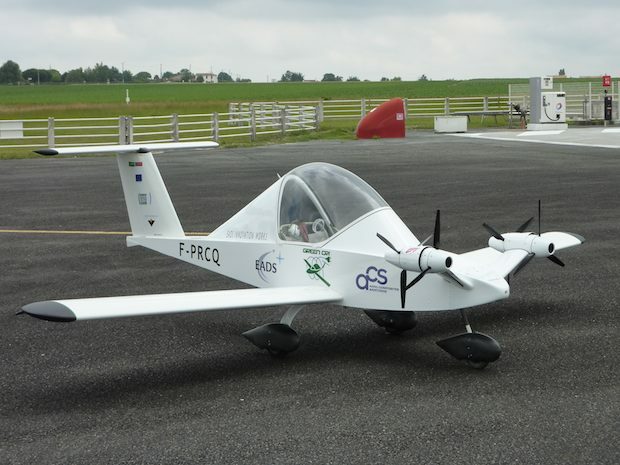 In order to compensate for the batteries’ extra weight, the aircraft uses lightweight composite airframe materials. EADS has big plans sustainable aircraft outside of the aerobatics world. The company recently unveiled a full-scale mockup of a diesel-electric hybrid helicopter, and earlier this month, EADS debuted the first ever algae biofuel-powered plane. The company has also teamed up with Eurocopter and BioCombustibles del Chubut on algae biofuel research. We’re betting (and hoping) that EADS’ algae research yields some concrete results for the commercial aviation world in the near future.